Cornell Tech is a revolutionary model for graduate education that fuses technology with business and creative thinking. Cornell Tech brings together like-minded faculty, business leaders, tech entrepreneurs, and students in a catalytic environment to produce visionary ideas grounded in significant needs that will reinvent the way we live. Our premise is that the rapid pace of innovation in the digital age calls for new approaches to commercializing university technology, new levelsof strategic collaboration between companies and universities, and new curricula for graduate education. We are creating new academic programs that blend technical depth, business know-how, design skills, and a “builder” mindset. The Cornell Tech campus is a place for discovery, alive with debate, both intellectually and physically. Our sustainable campus architecture isn’t just a backdrop for what’s going on inside the buildings; it’s a model for innovation that inspires and keeps the campus’s high aspirations on track. The first phase of Cornell Tech’s 12-acre campus on Roosevelt Island in New York City opened in fall 2017. Cornell assembled a team of award-winning architects to design a highly sustainable and open campus that facilitates the interaction between academia and industry that’s central to Cornell Tech’s mission. • The Bloomberg Center—named in honor of Emma and Georgina Bloomberg—is our first academic building and the center for teaching and learning on campus. • The Bridge houses a mix of cutting-edge companies working alongside Cornell Tech academic teams and start-ups. • The House, the world’s first residential passive house high-rise, provides on-campus housing for students and faculty with panoramic views of Manhattan and Queens. • The Verizon Executive Education Center and Graduate Roosevelt Island hotel, slated for completion in late 2019, will create a place where the campus can host academic gatherings and out-of-town guests. Cornell Tech has reinvented graduate tech education for the digital age, bridging the gap between academia and industry. 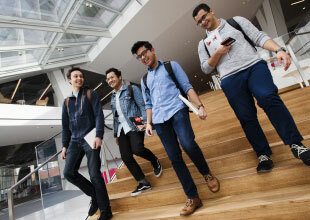 Cornell Tech’s Studio Curriculum maximizes student opportunities to develop and implement new product and business ideas, collaborate with classmates from across the Cornell Tech campus, and interact with innovators and thought leaders through New York City’s thriving technology and start-up communities. By bringing these talents together at the start, there is enormous potential for better, more impactful, and ultimately more successful companies and products. The Cornell Tech faculty are composedof senior professors recruited from top universities, outstanding junior faculty from the best PhD programs, and practitioner faculty who remain actively engaged in industry. Our faculty research is purpose driven, spurring relevant and valuable progress. Research groups include Security & Privacy, Human-Computer Interaction, Artificial Intelligence, Physical Computing, Computing Systems, and Optimization Methods. The Jacobs Technion-Cornell Institute at Cornell Tech embodies the academic partnership between the Technion–Israel Institute of Technology and Cornell University that was the genesis for the Cornell Tech campus. The Jacobs Institute degree programs—Health Tech and Connective Media—focus on impacting specific NYC industries instead of traditional disciplines. In addition, recent PhD graduates are building companies at the Jacobs Institute through the Runway program, where post-docs transform their research into new companies and products. Cornell Tech is committed to building and diversifying the base of the technology talent in New York City. In partnership with the City University of New York and Verizon, we recently launched a new program: Women in Technology and Entrepreneurship in New York (WiTNY). WiTNY provides the access, incentives, and support needed for girls and women to succeed in the tech industry. With new computer science courses, scholarships, and internships, we will introduce thousands of women each year to potential careers in tech.